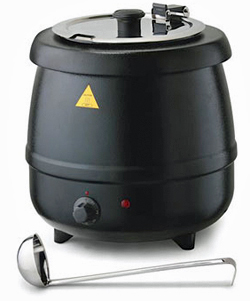 10-1/2 quart NSF commercial warming and holding kettle . Comes with a stainless steel ladle and soup insert pan. Stainless steel hinged lid and black powder coated steel shell. Tomlinson soup kettles are the perfect piece of equipment for any commercial kitchen, buffet line or home. Tomlinson soup kettles and warming equipment are known throughout the restaurant and commercial foodservice industry for their superior quality, construction and durability. 120 volt plugs in anywhere. I am very please with your product. Excellent quality soup warmer at an affordable price! Heats quickly and keeps an even temp. And it has a nice appearance. We can easily take the bain marie in and out of the kettle for easy refills, cleaning, etc. A great buy!